To access a computer in other places, Windows 7 already provides Remote Desktop Connection program. 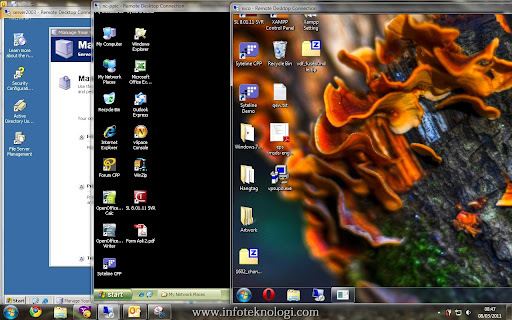 Here's a tutorial how to use Remote Desktop and setting. 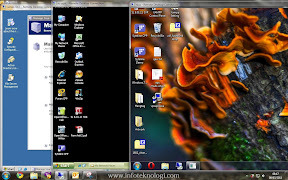 To change settings on Remote Desktop in Windows 7 go to Control Panel \ All Control Panel Items \ System click Remote Connection. And then on Remote desktop select Allow Connection from computers running any version of Remote Desktop (less secure) to allow the computer being remotely access by all versions of Windows (XP, Vista, Windows Server), but if you select Allow connection only from computers running Remote desktop with Network Level Authentication (more secure) then the computer can only be accessed from Windows Vista, 7 and Windows Server 2008..
Once you completed setting the computer, let's try to remote it from another computer. 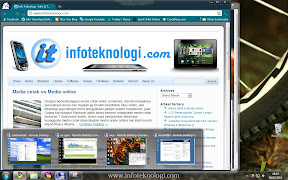 In Windows 7 and most versions of Windows the Remote Desktop shortcut is in Start menu > All Programs > Accessories > Remote Desktop Connection..
You will be presented with a field for typing remote computer name that you want to connect. Enter the computer name or ip address and click Connect. It will ask for user login accounts that we have registered earlier. On the Tab General you can set up to save the login and password so won't have to type it again by unselecting Always ask for credentials. You can also download the save and restore the Remote Desktop settings in this tab. Display tab, includes options to selecting screen resolution, color depth, and Display the connection bar when i use the full screen (should be checked). Local Resources, you can specify Audio settings, Keyboard, and other hardware such as printers and Clipboard. Remote Audio contain options to play the audio on the remote computer or on client computers, there is also a voice recording option. Keyboard options determine which keyboard combinations that will use on a remote computer or client. In Local Devices and Resources we can determine whether devices such as printers, hard drives, or hardware on the client computer will be shared with remote computer. 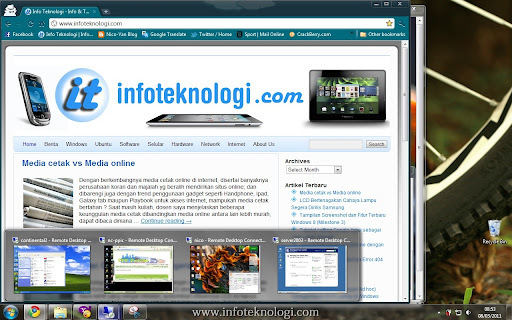 Programs tab allows you to run programs automatically after sucessfuly connected to a Remote Desktop Computer. Experience tab, determine the speed of the network, desktop appearance, fonts, and animated appearance in "remote desktop". There's also option to connect automatically when the connection is lost (Reconnect if the connection is dropped). Advance tab serves as a security , if you are confident with the security of your network you can select Connect and dont warn me. Connect from anywhere option can only works if the remote computer is connected to a domain in Windows Server 2008 and the Remote Desktop Gateway already installed.